Sat. Dec. 9th 2 to 5pm. See attached letter from Principal Ted Holden. Please address all questions and comments to him. 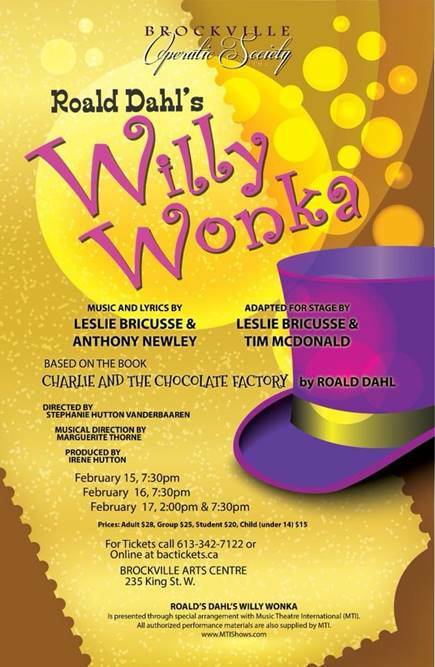 Katie and I are in the pit orchestra for this show. Hope you can make it! Christ Church Cataraqui Parish Centre (990 Sydenham Road, Kingston). 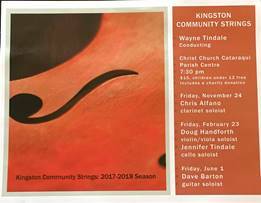 Kingston Community Strings and Fran Harkness who will play the piano part). A note from Kayla Holmes, our student teacher. I want to take this opportunity to thank each and every one of you for making my placement such a meaningful one. You all accepted me, and helped me right from the start, and it made my experience so fantastic. Thank you for letting me conduct in front of you, and for taking those opportunities to help me grow as a future teacher. This experience has brought out a passion in me that I did not know I had. I am making it my goal to start up my own adult music education program wherever I end up. I see what this program has done for all of you, and it brings me so much joy to see how much you all appreciate the program. Thank you so much again for your kindness and care throughout the past six weeks. You have helped me gain the confidence I need to run my own class some day. If nothing else, I’ve learned how to deal with you sarcastic folk….man, I’m going to age quickly. A huge thank you to Chris for allowing me into his class, and for being an incredible mentor. I have learned so much from him and all of you, and I am excited to see what the future has in store for me. I wish you all nothing but the best. I am sure I will see you all again soon! Kayla Holmes (Chris’ Student Teacher)"
Kayla Holmes, BMus (Hons), Dip.Mus.Perf. Desserts, bake sale, silent auction, craft sale and variety show. Entertainment during dessert, 6-7 and variety show 7-8:30 p.m.